WYLIE Spray Wyng™ - The Spray Wyng™ boom represents an important evolution in the design of the agricultural spray boom. 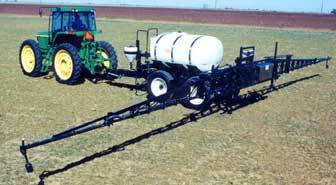 The SPRAY WYNG™ is isolated from the motion and the vibration of the tractor or spray rig by a "dampening gimble" suspension system that floats the boom free of the rig. This unique 3-dimensional suspension virtually eliminates both vertical and horizontal action. The SPRAY WYNG™ design principle is that the boom maintains a parallel position with the spray surface, as well as a perpendicular position with the line of travel, at speeds of up to 20 mph over rough terrain. The SPRAY WYNG applicator line is designed to allow the grower timely, high-speed, and accurate application while eliminating costly application fees. To understand the underlying design principal, it is important to be familiar with three basic terms of movement: Lift, Yaw & Roll. Wylie Manufacturing Company, P.O. Box 100, North Main Street, Petersburg, TX 79250. Tel: 806-667-3566 ; Fax: 806-667-3392.